Nicaragua is the largest country in Central America and also has the highest recorded gold production in the region, estimated at almost 10M ounces of gold. There are currently three large modern producing gold mines; Bonanza (3.1M ounces gold and 0.6M ounces silver produced), El Limón (2.7M ounces gold and 4.5M ounces silver produced) and La Libertad (170,000 ounces gold production, 16.3Mt at 1.5g/t gold reserves). The country's gold production from these modern mines is supplemented by small scale artisanal mining of both bedrock and alluvial placer gold in mining districts throughout the country. 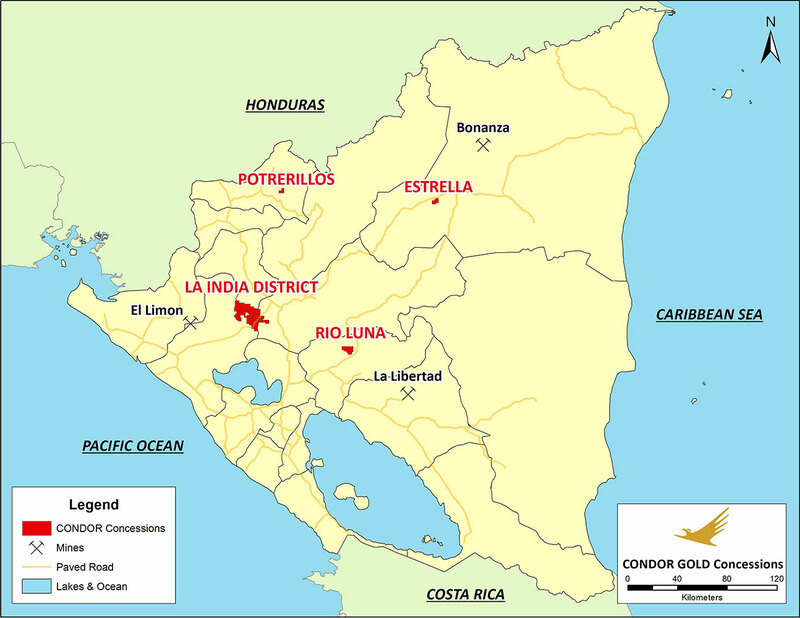 Past mining activity includes some large resources such as the Siuna and Rosita Mining districts (3.8Mt at 5.6g/t gold) and significant producing mines such as La India Gold Mine with an estimated 1.7Mt at 13.4g/t for 576,000 ounces production. Nicaragua’s geology is dominated by Quaternary volcanic and felsic intrusive rocks in the west and Mesozoic volcanic rocks in the east, with a belt of Palaeozoic metamorphic rocks in the north. All three geological regions host high-grade economic mineral deposits with active or historic gold mining. Condor has secured 100% ownership of thirteen concessions in four project areas all with known gold mineralisation and all but one either including or proximal to historical gold mines.